Johnson was a master on defense and almost flawless in all other aspects of pugilism. He was fast, possessed an outstanding jab and uppercut, and was practically impossible to hit cleanly. Johnson fought with his hands held low, but had such fast reflexes he could pick off a rival’s punches in mid-air. Nat Fleischer ranked Johnson as the #1 All-Time Heavyweight; Charley Rose ranked him as the #2 All-Time Heavyweight; Herb Goldman ranked him the #4 All-Time Heavyweight. Jack Johnson was the first black Heavyweight Champion and, as such, was the hero of his race. His ability in the ring is unquestioned, possibly unequalled. He could do it all, do it well, and do it with ease. Johnson, who later reversed the order of his given names, took the nickname Jack. He was the third of nine children, five of whom reached adulthood. 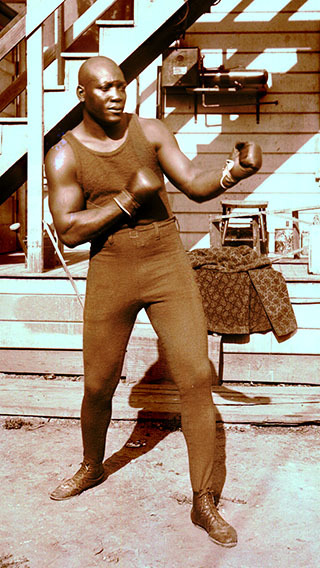 Johnson’s early record is incomplete, although in his notoriously unreliable autobiography he claims that one 16-round win was his first “regular” fight. He was just short of 16 years old. Until his fight with Burns, discrimination limited Johnson’s opportunities and purses. When he became champion, a hue and cry for a “Great White Hope” produced numerous opponents. At the height of his career Johnson was condemned by the press for having twice married white women and he further offended white supremacists by knocking out former champion James J. Jeffries, who was induced to come out of retirement as a “Great White Hope”. In connection with one of marriage, he was sentenced to a year in prison and was released on bond, pending appeal. Disguised as a member of a blackball team, he fled to Canada, made his way to Europe and was a fugitive for seven years. He defended the championship three times in Paris before agreeing to fight Willard in Cuba. Some observers thought that Johnson, mistakenly believing that the charge against him would be dropped if he yielded the championship to a white man, deliberately lost to Willard. In 1920 Johnson surrendered to U.S. marshals and served his sentence, fighting in several bouts within the federal prison at Leavenworth, Kansas. After his release he fought occasionally and appeared in vaudeville and carnival acts, appearing finally with a trained flea act. He wrote two books of memoirs, Mes Combats (in French, 1914) and Jack Johnson in the Ring and Out 1927, reprinted 1975). His personal conduct outside the ring (and many times within it) is a different matter. Modesty and humility were no part of this man. He was extremely arrogant and fun-loving and lived life at a reckless, carefree, helter-skelter, “get out of my way”, breakneck speed and manner. His behavior has been described as a public scandal and an irritant to white America. As a result, he was easily the most hated champion. The effort to dethrone him brought about the search for the “Great White Hope” during his 1908-1915 reign and produced an array of talent that has rarely been matched in any other period. But, even they could not touch Johnson in his prime. Johnson began a fight extremely cautious, quiet, and on the defensive (unless forced otherwise). As he slowly and surely turned the tide of battle his way, he became more aggressive and destructive in his style of fighting and abusive with his tongue. He preferred to “punish” his man rather than knock him out. Jack gave the impression of holding back during a fight, never going all out, and never pushing to the limit. Yes, he could get rough if he wanted. He cracked “Fireman” Jim Flynn’s jaw, broke Stanley Ketchel’s teeth off at the gum, and flattened Bob Fitzsimmons and left him glassy eyed and mumbling to himself. He “beat up” Sam Langford, breaking his nose in the process, and left an old Jim Jeffries in a battered heap. He knocked Marvin Hart out of the ring, and knocked Tommy Burns down twice in the first two rounds, broke his nose, and then taunted him for the next twelve rounds before he got bored and finished him off. Jack Dempsey described him as a combination of Jim Corbett and Joe Louis. Others say he was as vicious as Dempsey but faster; smarter and more powerful than Louis. I want more stuff like this! Sign up for B.H.O.F., and never miss out! © 2014 Boxing Hall of Fame. All rights reserved.